In 2007, the 40-member Public Order Management Team (POMT), including four women, was introduced into Tasmania Police to enable a response capability for Tasmanian protests associated with the Asia Pacific Economic Cooperation (APEC) summit. Today, nearly 25% of the team is made up of female police officers and interest in joining the group continues to grow. Team instructor Sergeant Karl Krelle says that the original course comprised four women (Constables Katrina Woodgate, Bernadette Heyward, Delayna Krelle and Megan Williams) and 36 men, up to and including the rank of Sergeant. Senior Constable Megan Williams remains a member of the group to this day. “From the outset, as a female, we were not treated any differently to the men and we were afforded all the very same opportunities. When our unit is in full kit (body armour and helmets) it is difficult to differentiate between male and female officers as we all look the same and it is for this reason we all need to have the same capabilities,” Senior Constable Williams said. recruiting campaign was undertaken across the state. “As a result of this activity, the 2016 POMT course saw 11 female members undertake the two day assessment phase, and nine were selected as part of 20 members to undergo the five day POMT training program. The POMT has 40 personnel in the group, state-wide and 22.5% of the POMT are female members,” Sergeant Krelle said. “I really enjoy being a part of a team with such great camaraderie, especially between the three districts. It’s awesome to be a part of a group that can come together, train hard, work hard and have fun,” Constable Bonde said. Since inception, the POMT has been deployed at numerous events and incidents, including the APEC Summit, logging protests in the Florentine Valley, Brighton Bypass protests, Reclaim Australia rallies, Chinese Presidential visit, Council of Australian Governments meetings and Dark MOFO. Above: Former and current members of the Public Order Management Team (Rear L-R) – (Ex-Members Sergeant Deearna Rowe, Senior Constable Jenny Carlisle, Senior Constable Delayna Krelle) – Current members Senior Constable Megan Williams, Constable Anita Rattray, Senior Constable Despina Amerikanos, Senior Constable Chloe Carr, (Front L-R) Constable Frances Bonde, First Class Constable Amanda Hall, Senior Constable Sam Brady, Constable Annika Coles, First Class Constable Carly Lovell. 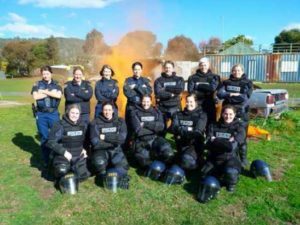 This page -- https://www.police.tas.gov.au/about-us/100-years-women-policing-tasmania-police/women-specialist-roles/public-order-management-team/ -- was last published on February 13, 2018 by the Department of Police, Fire and Emergency Management.